Perth Chamber Orchestra’s next concert in the 2017 Heritage Series breaks from the norm to present a concert in the middle of the day! Bring a bunch of girlfriends, bring your hubby or wife – perhaps your parents – for an event that is more of a ‘special treat’ than a concert. 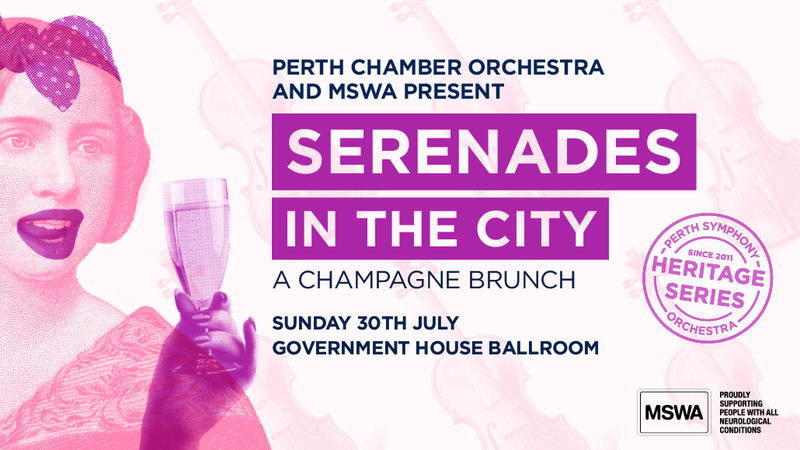 Join us for a delicious Champagne Brunch in the iconic surrounds of Perth’s stunning Government House Ballroom whilst the PCO strings perform several stunning works from the classical repertoire designed to warm the soul and lift the spirits. Hosted by celebrated WA journalist, music critic and author, Ros Appleby, the concert follows the PCO preferred format of stories and music accompanied by a menu designed to complement, offering a totally immersive ‘touch all the senses’ experience. Under the leadership of violinist Paul Wright, and the baton of Jessica Gethin, the PCO strings will perform a delightful mix of music including Britten’s Simple Symphony and a movement from Tchaikovsky’s stunning Serenade. Life drawings by local artist Ben Brennan of WAAPA ballerinas help bring the magic of the music to life, inspired not only by the carefully curated program, but also by the artwork of Edgar Degas. Ben’s art, incredibly drawn in front of the eyes of patrons will be generously donated to the Orchestra, and available as the major raffle prize on the day, as well as for purchase. We look forward to sharing a memorable morning of melodies with you.